So you’re ready to take the plunge (figuratively, not literally) and buy a new kayak, right? The last thing you want is a kayak that capsizes the moment you set foot in it, leaving you soaking wet treading water while trying to figure out how to get back in the darn thing. With that in mind, which kayak will be best to make sure you don’t take the plunge literally and can avoid an unexpected wet exit? For most, the answer is a nice, stable sit on top kayak, also known as a SOT kayak. Already know the difference between a SOT and a SINK? Click below to paddle straight for the reviews. 1 Sit IN or Sit ON Kayak? 2 Which Sit on Top Kayak is the Best? Sit IN or Sit ON Kayak? First of all, let’s just do a quick comparison of a sit in vs a sit on kayak. Slip on, slip off – Easy to get on and off whenever and wherever. Great for people who like to explore ashore or for paddling with kids who like to jump in the water. Self-bailing – Why do sit on top kayaks have holes? Scupper holes in the kayak make sure it never fills up with water. Water splashing over the deck of the kayak will automatically drain out. More stable – Sit on kayaks are usually wider, which make them more stable and less prone to tip over. Less chance of a wet exit! Warm water kayak – Sit in kayaks are better for warm water since you don’t have an enclosed cockpit to keep water off of your legs. If you live or go kayaking in colder climates, a SOT might not be the kayak for you. Nervous/beginner kayakers – All of the previously mentioned attributes make sit on kayaks an attractive option for beginning kayakers or those nervous of capsizing while kayaking. Warmer and dryer – The enclosed cockpits make sit in kayaks a better choice for those who want to stay drier due to windy or cold conditions. Farther and faster – Often, a sit in kayak will be narrower and skinnier which makes them faster in the water and great for covering longer distances along a shoreline. If you’re looking for a touring kayak instead of a recreational kayak, a sit in kayak is probably what you’re after. Better for storage – A sit in kayak will usually have a water tight compartment where you can store extra gear without fear of getting it wet. On the downside, this gear is usually less accessible while in the kayak than on a SOT. Those are the most basic differences between sit in and sit on top kayaks. In short, sit on top kayaks are ideal for beginning kayakers due to their ease of use and stability. Sit on top kayaks are also great recreational kayaks for families at the lake looking for a bit of fun and who aren’t necessarily interested in an aerobic workout or a serious sight-seeing excursion. An added bonus is that sit on top kayaks are good for big guys who might feel a bit too claustrophobic in a sit-in kayak. The extra width of a sit on top kayak provides more comfort to big guys who have longer legs or a wider waist. Which Sit on Top Kayak is the Best? Now that that’s covered, let’s take a look at three of the best SOT kayaks. The Perception Tribe 9.5 kayak might be the Goldilocks of the three kayaks reviewed in this article. This is a fun little kayak that is just right in many of its features. It’s not too small, it’s not too big, it’s not too heavy, and paddles just right for a smaller kayak. The only downside to the Perception Tribe 9.5 is that it can be somewhat hard to find. As you’ll see below, however, there are options about where and how to buy this nifty little kayak. Convinced the Perception Tribe is just right for you? Buy one from West Marine HERE! ✅ Buying Tip: If you’re not in a hurry to get your kayak, you can save $100+ by purchasing from Amazon. The catch? Your kayak won’t ship for 1-2 months (Christmas gift anyone??). In reality, you might be saving even more as West Marine charges a $65 shipping fee to ship to your home so total savings would actually be $165! Store delivery is free, however. To take advantage of Amazon’s special savings, CLICK HERE. The Tribe features a comfort seating system (CSS) not offered by either of the other two kayaks featured in this article. The CSS has a foam seat cushion for added comfort on any length of excursion you want to take. It also boasts the largest weight capacity of either of the other two kayaks, safely accommodating a total of 300 pounds. The Frenzy isn’t the only one with versatility on its side, though. The Perception Tribe received high marks from many users for its ability to perform well in Class I/II rapids, small surf, motorboat wake, and flat water. “I have also paddled the harbor from an Otter and an OC Frenzy. This [Perception Tribe 9.5] blows away the Frenzy in comfort, speed, and there is minimal bow slap compared to a Frenzy as well”. Not only that, many big and tall users were also pleased with this kayak, preferring it to its 11-foot counterpart. While you often have to compromise on stability, tracking, or speed with a smaller kayak, with the Perception Tribe 9.5 that isn’t the case so taller users often still preferred the 9.5 foot Tribe to the 11 foot Tribe due to the usual perks (storage, transportability, weight) that come from having a shorter kayak. If you’re in the market for the best sit on top kayak, the Perception Tribe 9.5 might be just the right fit for you in terms of both size and performance. ✅ Related: Get the best seat for your sit on top kayak. Check out my kayak seat comparison review article here! This is one of the best-selling kayaks on Amazon. It’s a great entry level kayak because it’s offered at an attractive price point for people just getting started kayaking. Impressed by the Sundolphin Bali? Click HERE for a GREAT deal from Amazon! Due to its high-density polyethylene construction, this kayak weighs in at a reasonable 44 pounds with most users commenting that it was no problem to lift and transport this kayak to and from their vehicle. Even though this is a sturdy, stable kayak made from durable materials, the weight limit for the 10 foot Bali SS only tops out at about 250 pounds. For heavier individuals or big guys, users recommended going for the 12-foot version of this same kayak. Purchasers were pleased that this kayak comes in a variety of colors to choose from (hey, it’s the little things sometimes! ), which isn’t the case with every kayak manufacturer. Some companies only offer a choice of one or two colors to choose from, but the Sun Dolphin Bali SS comes in 6 different colors, including a pink kayak for all the ladies out there! Buyers should note that this model does not include a paddle or a seat cushion, although there is a backrest as well as a Portable Accessory Compartment that can be used as a tow behind. Many reviewers remarked that it definitely needs a bottom seat cushion and they purchased one separately. Several reviewers were very disappointed in the tracking of this kayak and were frustrated that it was hard to paddle in a straight line. Others said that it’s fine, especially for beginning kayakers, but the ones who did have trouble with it believed it to be a serious issue. This is a wet SOT kayak. Two of the scupper holes are located in the cockpit and allowed more water than usual in from below. Scupper plugs are not included in the purchase and were recommended to fix the problem. Even with plugs, water leaks in through some of the rivet eyes and elsewhere and pools in the cockpit regardless. Many reviewers complained of having to sit in 1.5” of water due to this design flaw. Despite these criticisms, most people were overall pretty happy with their purchase, especially given the relatively low price point. The Sun Dolphin kayak was made for easy paddling on lakes and rivers for casual and beginning kayakers. If that’s what you’re after, this kayak will be a good choice for you. Ocean is billing this kayak as “big fun in a compact kayak” and it looks like they deliver on their promise. Ready for an Ocean Kayak of your own? 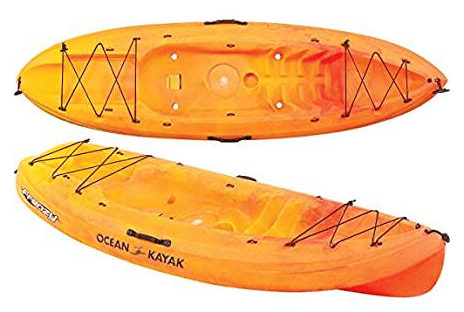 Amazon has great deals on the Ocean Kayak Frenzy for you HERE! At only 9 feet in length and weighing in at just over 41 pounds, the Ocean Frenzy kayak is easy to transport on top of a vehicle and less of a pain to store than many other recreational watercraft. The Frenzy also offers convenient carry handles at both the bow and stern of the kayak, as well as molded in-side handles that make it easy to carry from your car to your launch point and back. What sets this kayak apart from others is its versatility. Most kayaks designed with beginners and intermediates in mind are traditionally going to be designed for safer flat water like lakes and rivers, but Ocean has designed the Frenzy SOT kayak to be playful and responsive in small surf as well. The versatility extends to the types of passengers that can use it as this one is a good kayak for kids as well. That being said, it’s important to note that a kayak being sold with ‘compact’ as one of its main attributes means that the kayak itself is probably better suited for compact individuals. Kids and smaller adult humans will find this kayak comfortable. However, a few reviewers have remarked that this is not the most comfortable kayak for big guys and gals. Even though the width of the kayak overall is adequate at 31 inches, the seat itself is only 18 inches, a bit too narrow to comfortably accommodate plus-sized individuals. Not to mention that the kayak’s length being only 9 feet doesn’t leave much legroom for taller humans either. For normal or pint-sized humans such as kids, the Ocean Frenzy kayak receives high marks all around for ease of transport, versatility in the water, tracking, and maneuverability. If size isn’t a consideration for you, I’d short-list this kayak ASAP. 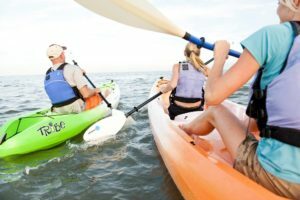 If you’re new to the sport of kayaking, a sit on top kayak might be a better choice to start off with than a sit in kayak. So long as you’re not kayaking in frigid waters, SOT kayaks are often a better choice due to their inherent stability, ease of getting on and off, and transportability. While any of the three sit on top kayaks reviewed here would be a good choice, it appears that the Perception Tribe 9.5 might be an unsung hero in the kayak world. Even though the Tribe doesn’t have as many reviews as the other two kayaks did, all the reviews from various sources gave it overwhelmingly positive marks. It appears that the Perception Tribe 9.5 sit-on-top kayak has hit the sweet spot of being just the right dimensions for paddlers of all shapes and sizes while also maintaining supreme versatility, comfort, speed, and tracking. It’s hard to find all of these attributes without compromising on something but Perception seems to have accomplished just that with their Tribe 9.5. In short, the Sundolphin is not that great. All those little add one leak water into the hull which then unbalances the kayaker. The hull is not a stable design and will dart left or right sometimes unexpectedly when ever a small amount of speed is built up. The back rest is also uncomfortable. The rails for the foot rest will also rub your ankles in a bad way. If you are paddling, the strap anchor for the paddle holder will be in the way of your stride if you have shorter arms. Plus the location of the paddle holder off the side is nice if you are stopped but any time a second paddle is carried there it sometimes dips into the water and steers the kayak off course. Thanks for sharing your opinion on the Sundolphin kayak. I hope others find it helpful! I don’t care for Sun Dolphin kayaks. They are cheaply made and do not track well. For the money, you can’t beat a Lifetime SOT kayak from Walmart. They are well made, stable and easily customizable. They also track well. At only $210, you can’t find a better kayak. Thanks for chiming in, Wayne! Lifetime does make good quality, affordable kayaks as well. Sun Dolphin is not for everyone but I do think it’s a good “gateway” kayak for someone who wants to get started in the sport for a low cost. I’m sure others will appreciate your suggestion at looking into Lifetime kayaks for a, perhaps, better quality low-cost kayak.